I cannot complaint about this place. There's a shuttle every 15 minutes coming from and going to the airport (MIA). The only suggestion would be making exiting the place a little easier, as it may take some time to get a person to open the exit gate for you (sometimes I have to call for help multiple times). Other than that, the place is the closest to the airport. Great location! I cannot ask for more. Best Covered Parking Spot in MIA! Traveled to MIA for a cruise (used both Lyft and Hotel shuttle). Decided to park at this location with SimpleAirportParking.com! What a great place. ONLY COVERED PARKING FOR MILES! Staff was awesome and accommodating. Car was treated with care. Would highly recommend this venue and SimpleAirportParking.com for your next parking/flying adventure. I almost forgot to mention the seamless online booking process! What a great website, that is extremely easy to use. I will use this service again and again, as well as recommend to friends and family! Left car at the Sheraton Airport Parking and drop off and pickup went smoothly. Although, we returned at 12:14 am, we were picked up within 15 minutes. Excellent provider! FREE shuttle service to the airport 24/7 (every 15 min, except 12 a.m. - 5 a.m. every 30 min) as well as exceptional valet, self, covered parking options and over-sized vehicle (RV) parking. Check in with parking attendants upon arrival. Valets will instruct you where to park for self-park or they will park your car if you made valet reservations. THIS RESERVATION IS FOR THOSE FLYING OUT OF MIA - hotel guests may book only if they are staying one night and flying out the next morning! Take I-95 via 836. Also from East to beaches via 836 (easiest directions from I-95). - Exit on to the 836 west (exit 3A). - Go West about 2 miles, exit on NW 37th avenue (Douglas Road). - Turn Right on NW 37th ave.
- Go to NW 21st street (2 traffic lights) then turn left. - On the left is the Sheraton Miami Airport Hotel. - Take 826, Palmeto expressway, go South to NW 36 street, exit East bound. - Continue East to Le Jeune RD/ NW 42nd ave turn right. - Continue South about 1 mile to the third traffic light, NW 25th st. and make a left turn. - Go about 5 blocks to the traffic light at NW 37 ave turn right. - Make a right at the next traffic light, NW 21 st. Sheraton will be on your left. We offer FREE 24 hrs a day shuttle services (every 15 min during day; every 30 min from midnight-5 a.m. ) to and from the airport, and we are 5 minutes from the airport guaranteed. Upon return, from baggage claim, proceed upstairs to the Departures level for hotel shuttle pickup. This reservation entitles you to drive in and park while you fly out of MIA; it allows you to park when you arrive and leave when your flight returns; this reservation is for flyers only. 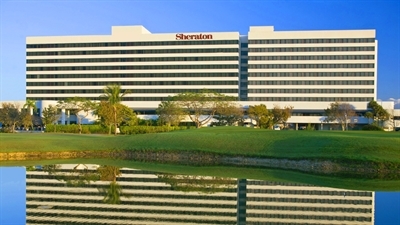 Located only half a block from Miami airport, Sheraton MIA airport parking is the closest off-airport parking facility in the area. Our low daily rates give our customers who are flying out of MIA the best parking services at the most affordable prices. Our FREE shuttle takes you to the airport and back upon your return. When you park at Sheraton Miami Airport, we help you carry your baggage, and there is no waiting in line.